Ancient Greece has been one of the greatest civilization to have ever flourished ever since the advent of humans. It had an enormous impact on the subsequent cultures that arose following the fall of the ancient Greeks. When we are talking about the rich history of ancient Greece, it can never be complete without bringing in some of the most famous Greek personalities who have had significant impact then and now. From creating the first of the works in literature, to commencing huge events like the ancient Olympics, to ground-breaking theories and experimentations in mathematics and science, some of the most influential people in ancient Greece gave us the earliest of concepts in various fields. Here is a list of such top 10 important people in ancient Greece, whose actions and contributions went on to have a great influence upon the generations that followed. 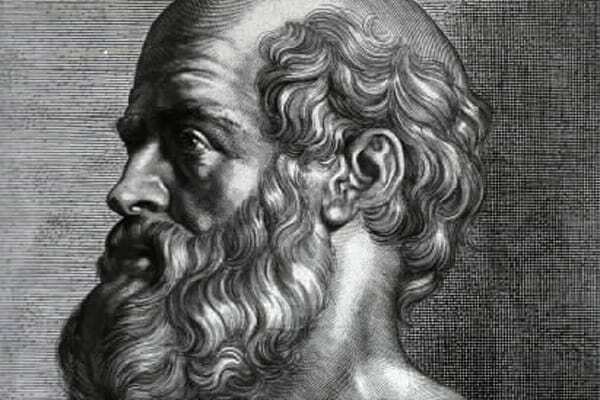 The famous ancient Greek physician who used to live around the age of Pericles of the classical Greece and was undoubtedly one of the earliest influential figures in the history of medicine. For his remarkable contributions to the earliest of known medical history, which helped to shape the later medical norms and culture referred to this day, he is often regarded as the father of western medicine. He also founded the Hippocratic school of medicine, which, in due course of time, established the practice of medicine as distinct field and thus revolutionized medicine and medical practice in ancient Greece. It was his initiative that helped medicine, attain the status it has at the present time, separating it from associated practices such as philosophy and theurgy. He was also credited to be the first person to clearly state that diseases were caused by natural reasons, and not by superstition and wraths of god – a belief that used to be widespread in the ancient ages. From the earliest of descriptions of severe health conditions such as clubbed fingers (also called Hippocratic fingers), lung cancer and cyanotic heart disease to the eventual professionalization of medicine, Hippocrates had a lasting impact in the field of medicine. Leonidas I was the famous Spartan king whose heroics on the bloodfest battle of Thermopylae was the stuff that legends are made up of. 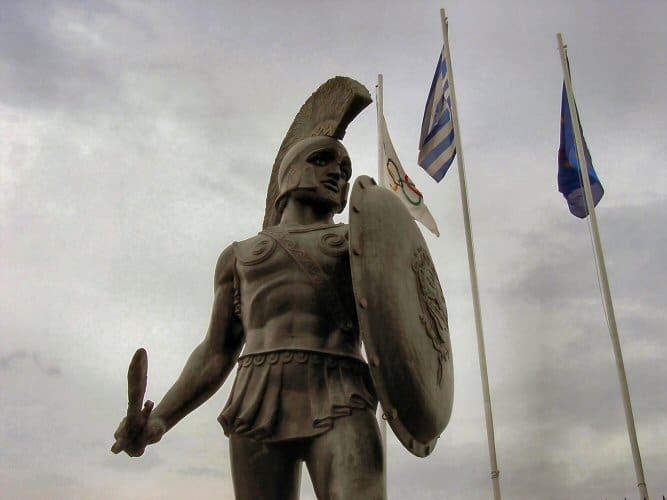 At a time when every single spartan citizen was built for battle, their daily routine pretty much covered up by rigorous fighting and training since early childhood – Leonidas was destined to glory when the Persian came knocking on the doors of ancient Greece. It was said that Leonidas, one of the sons of king Anaxandridas II of Sparta, was believed to be a descendant of Heracles (more popularly known as Hercules), possessing much of his strength and capabilities. Leonidas left a notable mark on the face of history with his impressive leadership against the might of Persians in the Battle of Thermopylae. His unbelievable last stand against all odds have been passed on to generations by the writings of famous Greek historian Herodotus. He told the story of 300 Spartan and 700 Thespians defending Sparta from a Persian invasion of “2 million” strong army for three days. Yes modern historians do put that number around 250,000 Persians, but the show of utmost bravery Leonidas and his men put up defending at the small pass of Thermopylae is used, to this very day, as a pinnacle example of how training, experience and tactical use of terrain can be used to maximize the potential of even the smallest of forces. 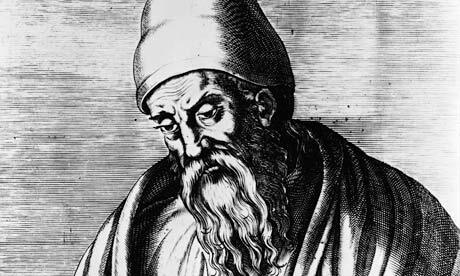 One of the earliest known mathematicians to have ever lived, Euclid of Alexandria was often regarded as the “father of Geometry”. Due to lack of earlier documentations, and the fact that most of the documents on the life of Euclid happen to have perished with time, a very little is known about his life. 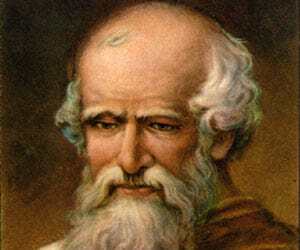 But he was mentioned by ancient Greek philosopher Proclus in this report aptly named “Summary of Greek mathematicians”. 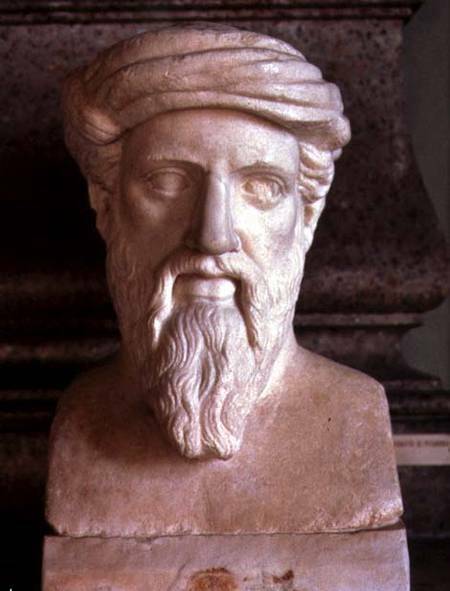 According to this, Euclid was an influential and active mathematician involved in the library of Alexandria, and that he lived in the time when Ptolemy I was around, which was much earlier than the era of another famous Greek – Archimedes. Regardless of all the confusion that still remain unresolved to this day, his contributions have had a great impact in the subsequent history of geometry and mathematics as a whole. His main work is the Elements, which gave birth to basic geometry in its concept and essence. Originally written in a set of 13 books, his famous work is used even today as a textbook in mathematics and comes second only to bible in terms of number of reprints sold. His collection of definitions, postulates, proposition and proofs created the base of mathematics that we are learning these days. He was the famous Greek mathematician who is said to have run down the streets of Syracuse naked yelling loud “Eureka! Eureka!” all the way for he had just the discovered the principle of buoyancy while taking a bath. But he was not just a mathematician, he was also a competent engineer, physicist, philosopher, inventor and astronomer among many more. Infact, he was one of the leading scientist who made his impact in the classical Greek era of the overall human civilization. His major contributions in science include some of the profound advances in physics. Moreover, his tactical mind along with his mechanical engineering genius helped Syracuse put on a strong offense when the Roman came knocking down their doors. He was considered to be the greatest mathematician of the ancient Greek era, and he definitely makes it to the list of one of the greatest mathematics genius to have ever lived. His precise calculations led to remarkably accurate approximation of the value of Pi. He also defined the geometry and volumes of different shapes such as the sphere and cylinder. 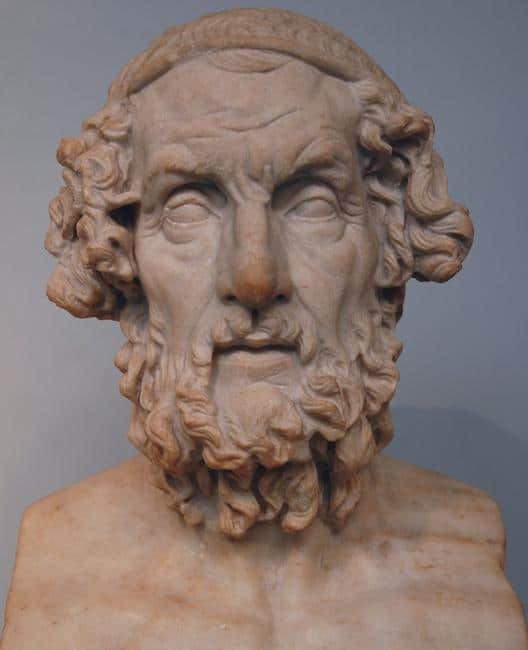 Often called the first of the Greek philosophers, Pythagoras was born in 570 BC on the isle of Samos somewhere off the coast of present day Turkey. Legends has it that his earliest days were spent as a learning disciple under some of the greatest mathematicians and astronomers of that time. All this while, he learnt a lot of secret teachings, taught himself to play the famous lyre and he could recite those epics by Homer just from memory. He then went on to travel the few centers of knowledge and philosophy in the ancient world – from the ancient Egyptian secret societies, to the famous Babylon located in the present day Iraq, Pythagoras armed himself with enlightenment from the ancient world’s most powerful civilizations. Such was his influence that en route to the town of Kroton, he was joined by more than 300 people who formed an insane cult worshipping him as an incarnation of the god Apollo Together with his cult, he went on to create dozens of mathematical and philosophical principles. They proved the Pythagorean theorem for calculating the area of a triangle. They even proposed the concept of the sun being at the center and the earth revolving around, almost 2000 years before it would be proved by the likes of Galileo and Copernicus. 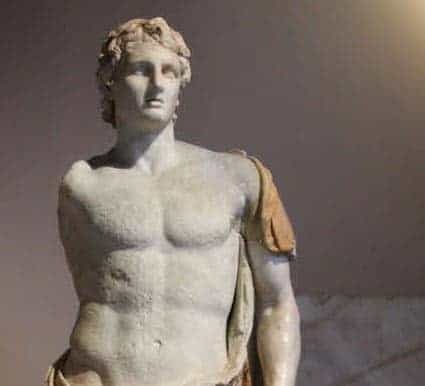 For obvious reasons, such activities miffed off a number of people in the-then Greece, and a group of angry mob ended his life burning him to death. He was the composer of Iliad and Odyssey, arguably two of the greatest poems penned down in the history of world literature. Even more astonishing is the fact that he created such powerful timestamps in the literature world more than 2800 years ago, way back somewhere between 8th and 9th century BC – though another set of thoughts say that he may have lived much earlier around 12th century BC. Since not much was documented about him at his time, the exact whereabouts about his birthplace, his era, what he was like and sometimes even his very existence still remain a mystery. But does not take away any points from his poems – the Iliad and the odyssey, for they are the symbolic roadmap to the world mythology. From the narration of the happenings in Iliad, which was a city within the state of Troy during the time of Trojan war in Iliad, to the specific focus on the ten year long journey Odysseus made from Troy to Ithaca after the end of Trojan war in Odyssey – Homer did create two classic epics that lie at the very base of western literature. These epics went on to have a massive impact and influence in the history of literature, the readers getting valuable insight about the ancient Greece. And one cannot simply miss the legend of Trojan horse and the heroics of Achilles and Hector that have inspired writers and artists around the world alike. 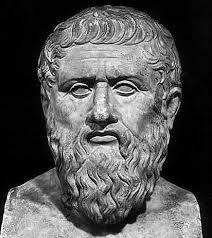 One of the foremost influential figures in the ancient philosophy, Plato was born somewhere around 428 BC – 423 BC in the ancient Athens. A bonafide student of Socrates, another philosophical legend from ancient Greece, he was named Aristocles by birth, but later earned the nickname of Platon (meaning broad) courtesy his broad built. His family had a rich history in the Athenian politics, and Plato too, seemed headed to a life in keeping with this history. But as it happened, he could not have taken a more different yet influential way. Amid certain political crisis, most noticeably the execution of his teacher Socrates, Plato needed no more conviction to leave the virtues of Athenian politics. 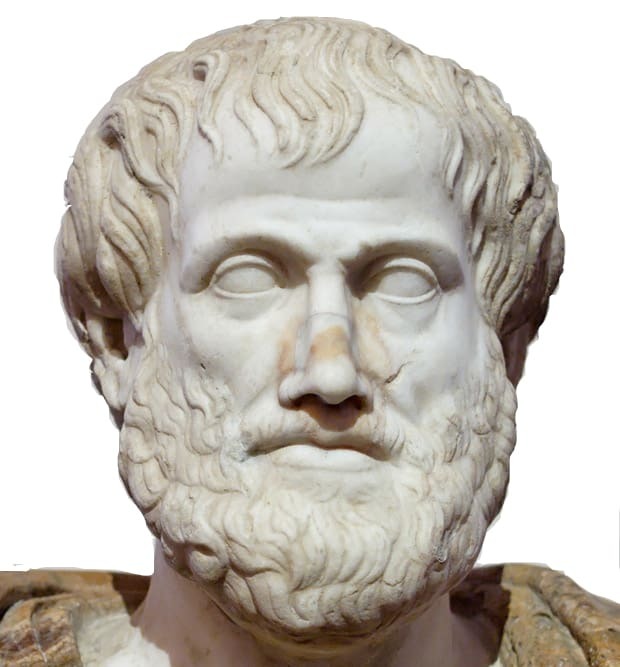 There were three pillars that laid the foundation to what we know as the western philosophy at present age – Aristotle was the youngest of them. A famous Greek philosopher and polymath, he gained all his knowledge and wisdom under the mentorship of Plato and later on made the likes of Alexander the Great. When it comes to being the quintessential figure in the history of western philosophy, he had indeed surpassed his master Plato, being the first person to create a comprehensive system of western philosophy, encompassing several essential aspects and virtues. Apart from revolutionizing the concepts of morality and aesthetics, logic, science, politics and metaphysics, he was also known as avid writer who covered a number of topics on poetry, theater, music, rhetoric and many more. His views on physical science had an enormous influence on the scholarship of the middle ages, and their impact lasted as late as the age of Renaissance, where the concepts were replaced by the Newtonian physics. Some of his now popular concepts and assumptions in zoology were so far off for the science of the ancient ages and many centuries to come that those observations were proved to be accurate as late as in the 19th century. Alexander III of Macedon, more commonly and fittingly known as Alexander the Great was born in Pella, Greece, in 356 BC. Born as an illegitimate child, considering the unbelievable deeds of heroics he went on to accomplish in his later life, legends were made saying he was the son of the God of Thunder Zeus himself, that he shared a bloodline with the likes of Hercules and Perseus. He was tutored under the apprenticeship of philosophical great Aristotle up to the age of 16 years. When his father Philip II of Macedon was assassinated in 336 BC, he inherited the Macedonian throne commanding a strong kingdom and a skillful army. 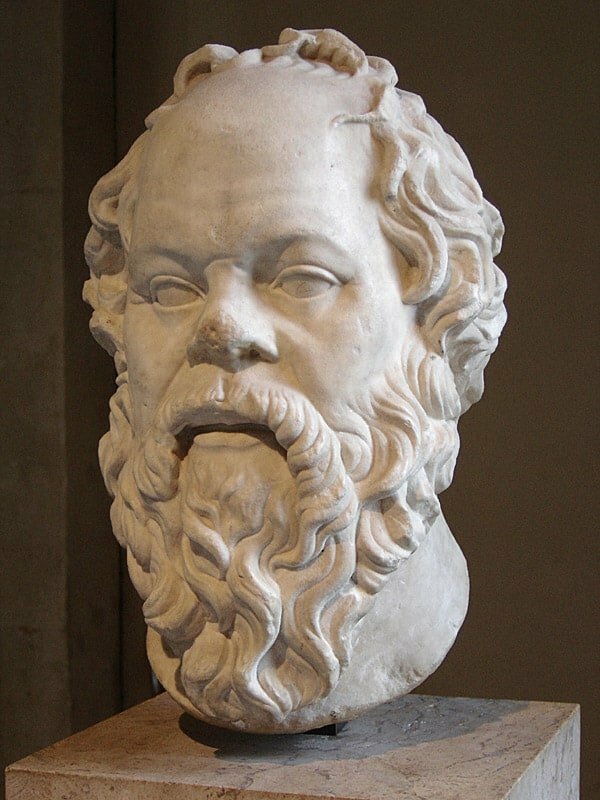 Born in the year 470-469 BC in Deme Alopece, Athens, Socrates is the forerunner in classical Greek philosophy and is credited as one of the most influential founders of western philosophy. This renowned classical philosopher, famous for his wisdom and knowledge, is documented majorly on accounts of subsequent writers. He is especially prominent in the writings of his many popular disciples Plato and Xenophon. It is clearly evident from these writings, more specifically through his mentions in Plato’s mentions, Socrates has had some major contributions to the field of ethics. As his so happened, his new philosophical views and ideas on ethics were not entertained by the then society and authority. He was eventually put on trial for two different charges – Corrupting the youths and impiety. In terms of philosophical beliefs, he was always at odds with many of his fellow Athenians, be it morally, ethically, intellectually or even politically. Disregarding any possible retributions that he may have to face for his philosophical stand, he went on to answer all the conviction made on his philosophical beliefs. He was ultimately sentenced to death by drinking a hemlock based liquid poison which he happily drank. The ancient Greek civilization reflects the pinnacle in the beginning of philosophical, political, social, ethical and scientific advances in human societies. The people listed above have had an enormous amount of impact in the subsequent western civilization and it would not be an overstatement to say that some of them had far reaching influences beyond the western world. Be it the revolutionary philosophers like Aristotle, Socrates and Plato, or the earliest of faces in western literature, including the likes of Homer, Herodotus, Pericles and so on, the Greek influence on philosophy and literature is phenomenal. The theories proposed by Archimedes, Euclid, Pythagoras are studied to this very day – laying the foundations of modern science and mathematics. And one can never dismiss the cultural impact that Alexander brought about when he invaded nation after nation, bringing them all under the single umbrella. Needless to say, this list limited to 10 people does not do full justice to all the justice to all the ancient Greeks who have had significant impact in their times and the times to come.